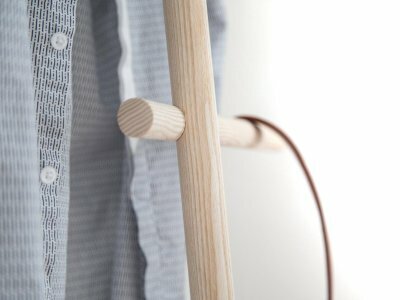 WENDRA is a lean-on clothes rack or towel rail, made of smooth wood, which design-lovers and not-so-gifted craftsmen alike can enjoy. The helpful assistant is the first piece of lean-on furniture that can be attached to the wall without the need for any tools, such as dowelling plugs or screws. The innovative combination of a sticky gel pad attached to a metal disc and a magnet integrated into a wooden pole guarantees an optimum attachment to the wall. As WENDRA can be quickly and easily disassembled, it is able to adapt to the increased levels of mobility in our lives. 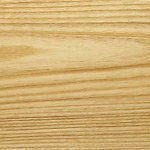 The warm tones of the natural wood or even the white lacquered wood grain of the Ash lend this piece of furniture its appeal. Thanks to it´s simple fixation und flexibility, WENDRA can be placed in the dressing room today, the bathroom tomorrow and in the bedroom the day after – for sure you will also find many other places for this piece of cloakroom furniture. Assembly of our lean-on cloakroom is child splay and requires no tools. Unpack the furniture, remove the protective foil from the sticky pad, fix the metal disc into the desired position on the wall, mount WENDRA in place and let the magnet at the end of the horizontal pole take care of the rest. An added benefit to the simple assembly process is that there’s no longer any need to fill in or paint over holes in the wall. WENDRA has been designed for narrow rooms, like hallways and bathrooms, as well as for open spaces. As with all kommod products, the dimensions have been developed with a fine feel for visual appeal, function and purpose.